The Right of Children to Free and Compulsory Education (RTE) Act, 2009 lays down the duties of the appropriate Government and the local authority to ensure that good quality elementary education conforming to norms and standards is provided, curriculum and courses of study are prescribed in a timely manner, and teachers are trained. New Delhi, 20 July 2017: In order to focus on quality education, the Central RTE Rules have been amended on 20th February, 2017 to include reference on class-wise, subject-wise Learning Outcomes. The Learning Outcomes for each class in Languages (Hindi, English and Urdu), Mathematics, Environmental Studies, Science and Social Science up to the elementary stage have, accordingly, been finalized and shared with all States and UTs. These would serve as a guideline for States and UTs to ensure that all children acquire appropriate learning level. Under the Centrally Sponsored Scheme of Sarva Shiskha Abhiyan (SSA), the State Governments and UT Administrations are supported on several interventions to improve teaching standards, including regular in-service teachers’ training, induction training for newly recruited teachers, training of all untrained teachers to acquire professional qualifications through Open Distance Learning (ODL) mode, recruitment of additional teachers for improving pupil-teacher ratios, academic support for teachers through block and cluster resource centres, continuous and comprehensive evaluation system to equip the teacher to measure pupil performance and provide remedial action wherever required, and teacher and school grants for development of appropriate teaching-learning materials, etc. Additionally, the Central Government, supports States and UTs on early grade reading, writing & comprehension, and early Mathematics programmes through a sub-programme of SSA namely ‘Padhe Bharat Badhe Bharat’ (PBBB) in classes I and II. Further, the Government has launched Rashtriya Aavishkar Abhiyan (RAA) programme on 09.07.2015, inter alia, as a sub-component of Sarva Shiksha Abhiyan and Rashtriya Madhyamik Shiksha Abhiyan (RMSA), to motivate and engage children of the age group from 6-18 years in Science, Mathematics and Technology through observation, experimentation, inference drawing, model building, etc. both through inside and outside classroom activities. 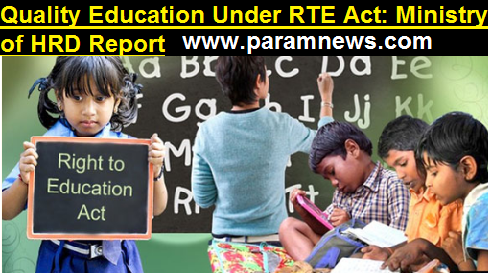 Further, as per model rules prescribed under RTE Act, 2009 a primary school is provided at a distance of 1km and an upper primary school is provided at a distance of 3Km, though the States have notified their own neighborhood norms as per their requirement. Government also provides various facilities to students at all levels in order to ensure high enrolment and quality of education including scholarships and teacher training. Quality Education Under RTE Act: Ministry of HRD, In order to focus on quality education, the Central RTE Rules have been amended on 20th February, 2017 to include reference on class-wise, subject-wise Learning Outcomes.